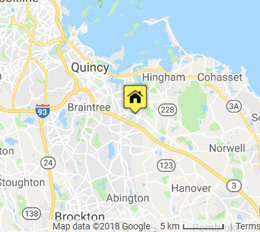 We’re proud to have provided years of reliable disposal service in Weymouth, Quincy, Brockton and surrounding areas. Doctor Disposal is a family owned and operated roll-off dumpster and commercial front-load dumpster provider serving homeowners, businesses, contractors and more. We have three decades (and counting) of industry experience! We offer environmentally-friendly disposal solutions. We’re a company that makes every effort to recycle dumpster loads whenever possible. 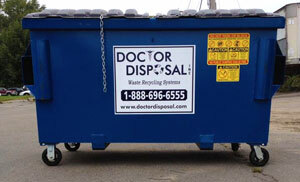 Clean up your home, business or job site in an eco-friendly way with the help of Doctor Disposal. Get a high-capacity roll-off dumpster for cleanups large and small. We offer a wide range of container sizes to accommodate small residential job, as well as full-size 40 yard bins for taking care of construction, demolition and total building cleanouts. 10 cubic yards – Remodeling projects, furniture/appliance removal, small garage cleanout. 15 cubic yards – Roofing tear off, garage/shed cleanout, attic cleanout. 20 cubic yards – Home cleanouts, yard debris cleanups, small renovation jobs. 30 cubic yards – Building cleanouts, yard waste, large garage/shed/barn cleanout, light demolition. 40 cubic yards – New construction, demolition, renovation, large roofing project. We rent to homeowners, contractors, businesses, realtors, property managers and more. We’re dedicated to fast delivery and responsive customer service. Call 24 hours a day! We go the extra mile to ensure you’re satisfied with your dumpster rental. Doctor Disposal carries 2 to 10 cubic yard front-load dumpsters that are ideal for businesses, apartment buildings, condominiums, and multi-family homes. Our bins help maximize disposal capacity while providing an exceptional value on waste hauling services. Our bins are easy to load and feature plastic lids/sliding doors and locking mechanisms at no extra charge. 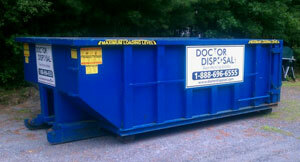 Doctor Disposal will customize a plan to suit your needs and budget. Recycling containers and toters are available, as well. Your Local Eco-Friendly Disposal Leader! 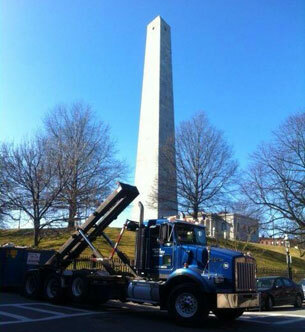 Help preserve the environment right here in Massachusetts by choosing Doctor Disposal for your bulk disposal needs. We care about the environment and take pride in doing our part to protect it one dumpster at a time! Put our 32+ years of combined industry experience to work for you. Give us a call to discuss your project and receive a complimentary quote on commercial dumpster service or roll-off container rental. We look forward to working with you!